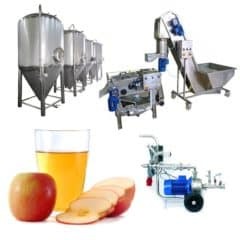 The Cider Production Line kit type CIDER LINE MODULO 2000M-1320E (in this expanded configuration) includes all equipment necessary for the annual production from 44000 to 132000 liters of cider and also the most useful expanded equipment for more effective work in the plant. The actual annual production capacity depends on the selected duration of the production cycle (typically 2-6 months). This configuration of the CiderLine includes set of fermenting/maturing cylindrical-conical tanks with usable volume 12x 2000 lt. All tanks except one are using for both cider fermentation and maturation process. One tank is used as a buffer tank during the fruit-must cleaning process, carbonation process or bottling process (or filling a cider into other packages like kegs, PET etc.) Simple design with independent devices allows easy assembling of all cider production line by customer without our specialists. This configuration doesn´t include assembly work – this ensures customer himself according the assembly manual. Optionally we can deliver the CiderLine Modulo including installation work (for an assembling fee and our worker´s team transport and accomodation costs). 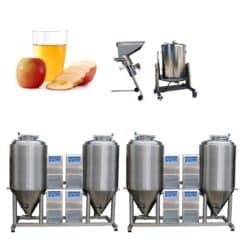 The Cider Production Line kit type CIDER LINE MODULO 1000M-900E (in this expanded configuration) includes all equipment necessary for the annual production from 30000 to 90000 liters of cider and also the most useful expanded equipment for more effective work in the plant. The actual annual production capacity depends on the selected duration of the production cycle (typically 2-6 months). This configuration of the CiderLine includes set of fermenting/maturing cylindrical-conical tanks with usable volume 16x 1000 lt. All tanks except one are using for both cider fermentation and maturation process. One tank is used as a buffer tank during the fruit-must cleaning process, carbonation process or bottling process (or filling a cider into other packages like kegs, PET etc.) Simple design with independent devices allows easy assembling of all cider production line by customer without our specialists. This configuration doesn´t include assembly work – this ensures customer himself according the assembly manual. Optionally we can deliver the CiderLine Modulo including installation work (for an assembling fee and our worker´s team transport and accomodation costs). 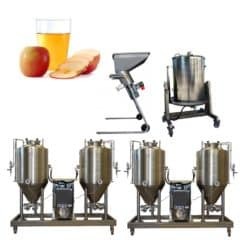 The Cider Production Line kit type CIDER LINE MODULO 2000M-1800B (in this basic configuration) includes all equipment necessary for the annual production from 60000 to 180000 liters of cider. The actual annual production capacity depends on the selected duration of the production cycle (typically 2-6 months). This configuration of the CiderLine includes set of fermenting/maturing cylindrical-conical tanks with usable volume 16x 2000 lt. All tanks except one are using for both cider fermentation and maturation process. One tank is used as a buffer tank during the fruit-must cleaning process, carbonation process or bottling process (or filling a cider into other packages like kegs, PET etc.) Simple design with independent devices allows easy assembling of all cider production line by customer without our specialists. This configuration doesn´t include assembly work – this ensures customer himself according the assembly manual. Optionally we can deliver the CiderLine Modulo including installation work (for an assembling fee and our worker´s team transport and accomodation costs). The Cider Production Line kit type CIDER LINE MODULO 2000M-1800E (in this expanded configuration) includes all equipment necessary for the annual production from 60000 to 180000 liters of cider and also the most useful expanded equipment for more effective work in the plant. The actual annual production capacity depends on the selected duration of the production cycle (typically 2-6 months). This configuration of the CiderLine includes set of fermenting/maturing cylindrical-conical tanks with usable volume 16x 2000 lt. All tanks except one are using for both cider fermentation and maturation process. One tank is used as a buffer tank during the fruit-must cleaning process, carbonation process or bottling process (or filling a cider into other packages like kegs, PET etc.) Simple design with independent devices allows easy assembling of all cider production line by customer without our specialists. This configuration doesn´t include assembly work – this ensures customer himself according the assembly manual. Optionally we can deliver the CiderLine Modulo including installation work (for an assembling fee and our worker´s team transport and accomodation costs).